Go ahead and enter “Bluetooth speaker” into Amazon or Google’s search bar; you will be hit with a ridiculous wave of dozens (if not hundreds) of models to choose from. Some highlight special features, like water-resistance, portability, or some funky shape to get your friends talking. Well good news, I’ve been testing a speaker that checks all of these plus a couple more! It’s the Nekteck NK-S1 Bluetooth speaker. It’s a mighty mite that is still more than a respectable powerhouse in terms of usability & audio performance. “But who the heck is Nekteck?! ?”, I hear you asking. In all honesty, I asked the same question when offered to review this speaker by my editors; I had zero interaction with them beforehand. 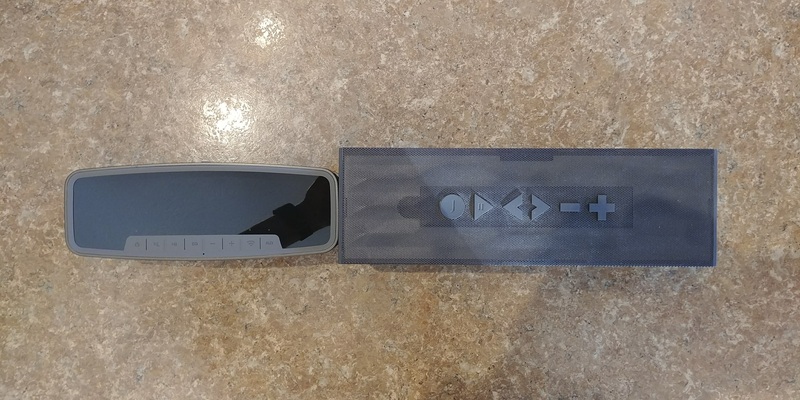 Turns out you can think of Nekteck as a competitor to Aukey or even an Anker: a company that has found its niche in offering various low-price but rather high-quality hardware and accessory products to the consumer masses. 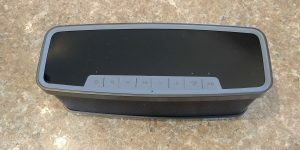 In addition to various Bluetooth speakers, they offer earbuds, wireless/battery/wall/solar chargers, iPhone battery cases, car jump starters (the increasingly popular battery-powered style), solar-powered lights, selfie-sticks, USB/Lightning cordage, screen protectors, and even a wireless doorbell system for your home. There’s even a back & neck massager in its offerings. The speaker is smaller than I thought when it arrived in its box, coming in at a petite 3″ x 3″ x 7.5″. 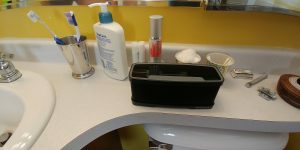 It feels almost half the size if my Big Jambox. The unit comes in a classy, low-slung black look, with the Nekteck logo low & right. it looks like the sound could come out the unit in a 360° arc, but there are three directions that the speakers fire: front, back, and down. In the box you get the speaker, USB-to-microUSB charging cable (wall wart not included), a short 3.5 mm audio cable, and a small how-to guide. The speaker is marketed as a “2.1” unit; meaning you get the normal “2” front-firing channels for stereo sound @ 10 watts, plus there’s an additional “.1” down-firing subwoofer speaker that is meant to add some meat to the low-frequency notes, at an equal 10W. Off this subwoofer are a pair of passive bass radiators front and back to fill out these low-frequency tones. This control layout is just about perfect, in my opinion. It doesn’t overwhelm you with choices, but it doesn’t make it so sparse that you’re left scratching your head as to how to operate the thing. On the back of the unit is the micro-USB charging port and 3.5 mm aux audio jack, if you feel the need to cable the speaker to your phone or a different audio unit. After the requisite charging and firing up the speaker, you are greeted with a pretty awful female recording to confirm power is on. As nice as the speaker sounds, this voice-over is pretty bad. 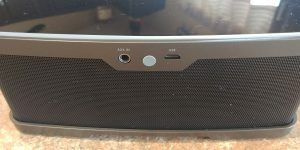 One feature of this speaker I absolutely adored is its ease of pairing with Bluetooth sources I’ve had some speakers that have flat-out refused to pair up, or seem to only when the moon is at a waning crescent….it can be that weird with some units. All you do is press the wireless/Bluetooth button (looks like a wi-fi simple, but it gets the point across), and turn on ‘search’ in your source’s Bluetooth settings. 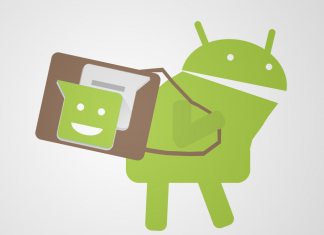 I’ve tried it on a half-dozen devices, and every time the pairing happened within mere seconds (complete with a cringe-worth “Pairing successful!” announcement from the voice-over). My 14-year-old figured it out without a blip, which simply made me smile. OK, now for the audio performance. In all, I’m pleasantly surprised by the audio chops of this little speaker. It can handle both small room background filler (accomplished with aplomb playing Vitamin String Quartet while preparing a meal), as well as outdoor bass-booming party music (rocking Jock Jams while CRUSHING my middle-schoolers in driveway basketball!). This speaker has two secrets that allow for this to happen so well. The first we’ve covered already; the dedicated subwoofer. It fires downwards, and because the speakers sits on wide rubber feet, this down-firing bass can then radiate out in all directions in a reflected fashion. Also, the front and back-facing ‘radiators’ (essentially tubes), allow for any remaining bass to escape laterally, filling the sound in a more direct vector. The overall sound can be just a tiny bit muddy (missing some of the filled-out mids & piercing high notes), but given the size of the unit, it’s completely forgivable. 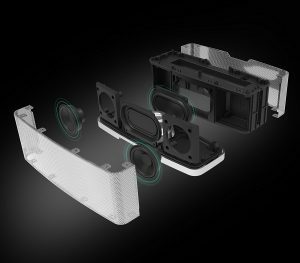 And I must emphasize the tiny bit part, as once you consider this speaker retails for $60, you realistically cannot fault it. Or you’re some kind of audiophile-butthead expecting $500 performance out of a $60 unit. Either way. Listening to some very clean string music while powdering my nose…. prepping for the day. The mids and highs are really allowed to shine, and your music comes out extra-crisp here (I also highly recommend this mode when you’re using it as a speakerphone extension….voice frequencies are so much clearer). The party mode pumps up the subwoofer, adding extra “oomph” into all your tracks. Don’t get me wrong, this mode was used in-house on more than one occasion, and worked very well here too; just don’t expect your classical music to really sound great in this mode. The battery is listed as a 2000 mAH, stating you should get 8 hours of playback and 300 hours of standby. I never did get close of either of these number to really test the unit, but it’s likely close and also probably depends on how loud you blasting your music, as well. 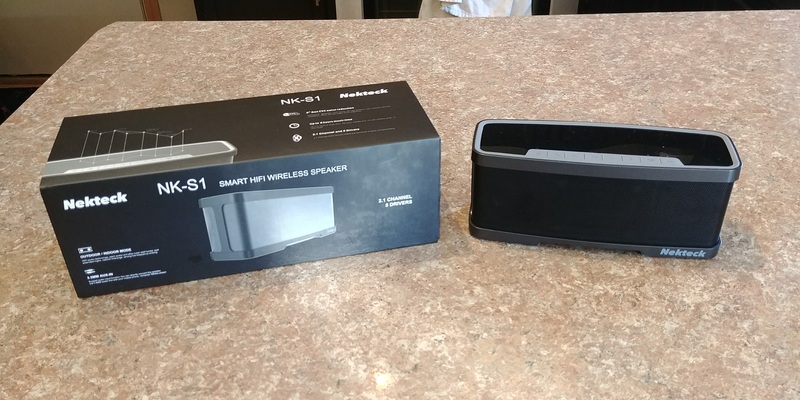 The speaker uses Bluetooth 4.1 with a 10 meter rated coverage; I feel safe in giving that claim a thumbs-up as I ran all through and around the house during my time with it and never had a single dropout….it actually performed much better than my bigger (and more expensive) Big Jambox. 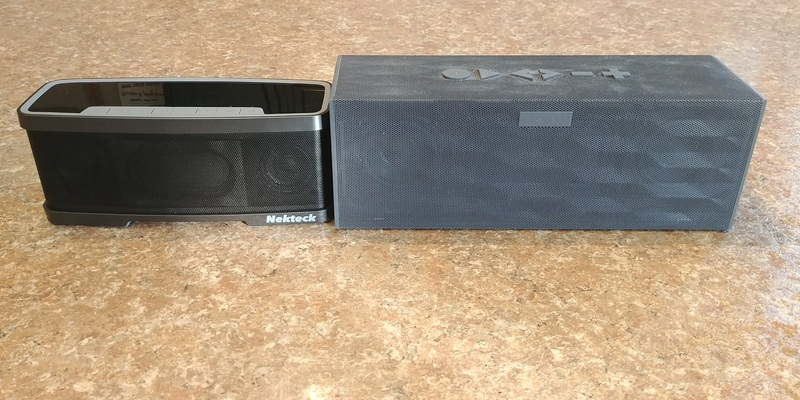 Overall I really, really love the Nekteck NK-S1 Bluetooth speaker. I received a great combination of size, audio quality, Bluetooth consistency, and ease-of-use, that I had yet to really grasp in the world of wireless audio. The thing was an instant hit with my family, was quickly became the go-to unit around our house, leaving several other options collecting dust. 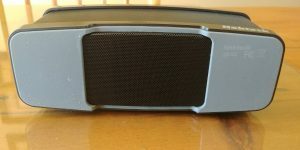 I can only highly recommend the NK-S1 speaker for you home, too! You can pick up the Nekteck speaker from Amazon. 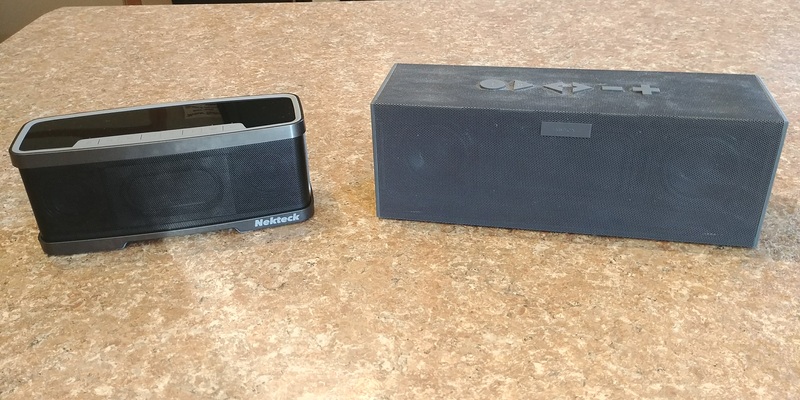 The Nekteck NK-S1 bluetooth speaker is a mighty mite of audio & bluetooth performance, packaged in a portable and affordable package!